The Hemi Elevating Leg Rests with Padded Calf is an attachable accessory to any Invacare manual wheelchair such as the ProBasics Value K1 Wheelchair. The elevating leg rest offers the ability for the wheelchair user to rest their legs at a more comfortable level. By elevating the legs, it also aids in relieving symptoms such as varicose veins and swelling in the legs, by simply elevating your legs you help treat or slow down the occurrence of these symptoms. While many wheelchairs offer a standard foot-rest, there will be a time where the user will need or feel the need to prop up their legs for comfortability and since not all wheelchairs come with an extra pair, make sure you are ready and set for it. The Hemi Elevating Leg Rests with Padded Calf is offered in two options, Invacare T94HAP Aluminum Hemi Elevating Legrest and the Invacare T94HCP Composite Hemi Elevating Legrest for your preferred type. The calf pads are made of a thick padded foam with a high resistance to provide full support to the calves when elevated. The aluminum design option is one option people enjoy for the clean, shiny finish, while the composite finish provides more of a grip and has a clean finish as well. If safety is more of a feature you would like to focus on, you may be interested in the Swingaway Hemi Footrests with Heel Loop Footplate instead. If you are looking for additional accessories for your wheelchair, be sure to check out our Wheel Chair Accessories page for accessories you may not have known you needed. Are these swing away leg rests? These are unable to swing away. They attach to the wheelchair for leg elevation. Can these be used on a Medline wheelchair? 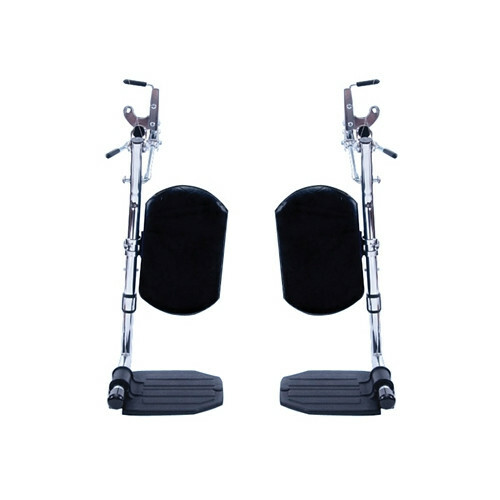 Invacare footrests are generally compatible with their own brand only. For footrest compatibility regarding Medline products, we recommend searching through Medline's products on our site. You may also contact the manufacturer for a list of compatible products.